This episode is all about sales funnels: What they are, why they are important and how you can use them to build your business and create financial success! Learn how to create your sales funnel to fit your business. The two most overused, and least understood words for many mompreneurs are “Sales Funnel”. 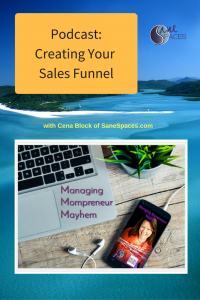 Please join host Cena Block as she fills in the gaps and helps you understand what a sales funnel is, why it’s so important to your online business success and how you can incorporate these strategies into your current business!